Baymack is a fun game to discover awesome videos and earn giftcards. The best mobile rewards game that helps you earn daily inthe most fun way.Test your Knowledge: Answer 5 easy questions andwin daily prizes. Play more to earn higher prizes daily.Play withfriends: Baymack is more fun with friends. Get your friends to playalong and you unlock power-ups that help you win faster.DailyChallenge: Play daily challenge and complete levels to earn prizes.Level up in the challenge to unlock higher rewards. Redeem yourrewards daily: Now earn and redeem on the same day. Get gifts inyour account daily. 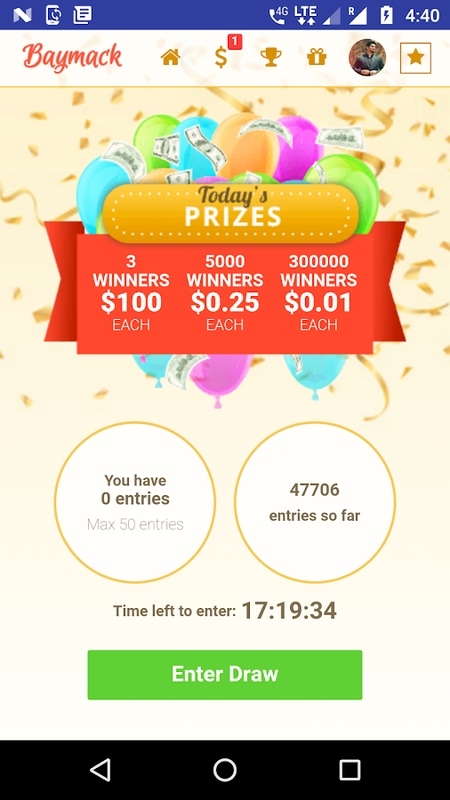 Outbuck is fun, free app to scratch and have a chance to win realmoney instantly! Outbuck is a free scratcher game for a chance towin real money and rewards. With daily opportunities to win up to$25,000 in cash instantly! Scratch and have a chance to win realmoney and gift cards instantly. Outbuck Features: WIN GIFT CARDSAND REAL MONEY ✔ Win up to $25,000 and Gift Cards by matching 3winning symbols on the instant win scratch cards! ✔ New scratchcards daily ✔ Bonus scratch cards daily EARN REWARDS ✔ Earn freeAmazon, Skrill and PayTM gift cards. ✔ Earn tokens that can becashed out for above Gift Cards/ Real Money. ✔ Earn up to 250million tokens by inviting friends! Download Outbuck to win prizesand gift cards Today! Outbuck is 100% free mobile gaming app thatallows users to win money and gift cards and prizes with no in-apppurchases or deposits. These sweepstakes are devised asnon-gambling promotions and are intended solely for entertainmentpurposes. *Google Inc. does not sponsor, nor is any way affiliatedwith Outbuck and/or the sweepstakes prizes. *Outbuck is a freemobile gaming app that allows users to win money and prizes, nopurchase is necessary. Sharkday is fun, free app to scratch and have a chance to winrealmoney instantly! Sharkday is a free scratcher game for a chancetowin real money and rewards. With daily opportunities to win upto$25,000 in cash instantly! Scratch and have a chance to winrealmoney and gift cards instantly. Sharkday Features: WIN GIFTCARDSAND REAL MONEY ✔ Win up to $25,000 and Gift Cards by matching3winning symbols on the instant win scratch cards! ✔ Newscratchcards daily ✔ Bonus scratch cards daily EARN REWARDS ✔ EarnfreeAmazon, Skrill and PayTM gift cards. ✔ Earn tokens that canbecashed out for above Gift Cards/ Real Money. ✔ Earn up to250million tokens by inviting friends! Download Sharkday to winprizesand gift cards Today! Sharkday is 100% free mobile gaming appthatallows users to win money and gift cards and prizes with noin-apppurchases or deposits. These sweepstakes are devisedasnon-gambling promotions and are intended solely forentertainmentpurposes. *Google Inc. does not sponsor, nor is anyway affiliatedwith Sharkday and/or the sweepstakes prizes. *Sharkday is a freemobile gaming app that allows users to win moneyand prizes, nopurchase is necessary. The Google AdSense app provides an easy way to view key data fromyour AdSense and AdMob accounts. It allows you to access reportingfeatures anywhere, directly from your mobile device. The appprovides you with an account overview, as well as access todetailed performance reports on all key metrics. Available reportsinclude: top ad units, channels, sites, countries and more. Theaccount earnings report is also accessible via a resizablewidget.Please note: YouTube revenue is not available in thisapp.Permissions Notice • Contacts: Needed to access your AdSenseaccount. With our improved app, you'll get the convenience you want, pairedwith the secure transactions you've come to trust from PayPal.Plus, there are no transaction fees when sending money to Friendsand Family in the U.S. when you use your bank account or balance.HELP KEEP YOUR FINANCIAL INFORMATION PRIVATE AND PROTECTED You canget peace of mind you deserve with: 24/7 transaction monitoringSecure encryption technology Fraud protection Fingerprint andtwo-factor authentication (activation required) SEND MONEY TOFRIENDS AND FAMILY FOR FREE It’s free to send money to Friends andFamily in the U.S. using your bank account or PayPal balance.Settle up for your share of the bill, send a loved one the gift ofmoney, or request money from a friend with ease. PAY FOR GOODS ANDSERVICES WITH CONFIDENCE Sending money to someone you don't know?With PayPal, you can send it with confidence. When selecting Goods& Services, your eligible send money transactions can beprotected by Purchase Protection. Terms and Limitations apply. And,if the recipient doesn't have a PayPal account, can open one easilyfor free. ACCESS YOUR BALANCE INSTANTLY WITH THE PAYPAL CASH CARDEasily transfer funds from your bank to your PayPal account andaccess your balance with the PayPal Cash Card. Shop in-store,online or anywhere Mastercard is accepted. Plus, withdraw yourPayPal funds at ATMs worldwide. SEND MONEY TO PAYPAL ACCOUNTSAROUND THE WORLD* We make it easy to send money internationally.Choose from a range of currencies to help maximize the value ofyour dollar with our competitive fees. Sender and recipient musthave a PayPal account. The Cash Time - Number One app to earn rewards and make money withyour deviceThe Cash Time for playing games and make cash forcompleting tasks. Earn points and redeem your free gift voucher andin less than 48 hours you will get your requested payment/gift.HowMake Money works? - Today offer task compulsory for redeem.-Download our app, login with your Google account- Complete as manyas possible offers to earn points- Once you hit the minimumrequired points for your gift all you have to do is to hit theRedeem button and wait a few hours before we check and send yourgift, simple as that!- Enjoy your free reward! USE INVITE CODE 'CFA' FOR BONUS POINTS TOSTART!!!! **************************************************FREEGift Cards! FREE In-App Purchases! ⬇️ 🎮 🎶 ➡️ 💰 ❤️‍ 💰 ❤️‍ 💰 ❤️‍ 💰❤️‍ 💰FREE Gift Cards! FREE In-AppPurchases! **************************************************Try outcool new apps, collect points, and redeem those points for freegift cards!Featuring rewards from:💰 Google Play💰 iTunes💰 Amazon💰GameStop💰 Starbucks💰 Rixty💰 Skype💰 Best Buy💰 CVS💰 Walmart💰 Target💰eBay💰 Trion💰 Old Navy💰 Gap💰 Columbia... and many more!! How Do IGet Points? ?It's easy, just download new apps from Cash for Appsand BOOM! receive points for these downloads within minutes. Afteryou receive the points you can delete the app from your device.FREE Cash You Say? ?Once you've saved up enough points (300 points =$1) redeem them for a gift card from our long list of valuablerewards! What Kind of Free Stuff Can I Get? ?We have plenty of giftcards that can get you free music, in-app purchases, like gems andother gaming resources, plus much more! **We're the only cash appout there that offers $5 iTunes cards! Which means you can redeemthat free cash even faster!How Long Will it Take Me to Get a GiftCard? ?Most of our users can accumulate enough points for a freegift card within just 10 downloads! That's right, we're the fastestpaying out cash app!! It's best to check daily for new offers,since some are only out for 24 hours.How Can I Get More PointsFaster? ?Invite your friends to download Cash for Apps and enteryour unique referral code upon registration. They receive 20 pointsto start, and you get 90 points as soon as they download theirfirst app! Already have our iOS version? Don't sweat it.. there'sno need to create another account. Download Cash for Apps on anyother device and log into your original account to receive morepoints for downloads on the same account! Just note that yourpoints notification will only show on your original device. NeedMore Information? Check out our FAQpage:https://getcashforapps.zendesk.com/hc/en-us/categories/200250359-FAQorgive us a shout at [email protected] for that extra personaltouch. CashOut is the newest and hottest money-making app on the PlayStore.How it WorksWith CashOut you can earn free cash and giftcards by completing offers with only a few taps. Offers consist ofsimple tasks such as installing free apps, playing games,completing surveys, and watching videos. For every offer youcomplete, you will be awarded a certain amount of in-app Coins.These Coins can be redeemed for PayPal Cash and other real-lifeGift Cards.You can also earn a lot of Coins by inviting friends andfamily to use the CashOut. When you refer a friend you and yourfriend will each be rewarded. In addition to that, you will beawarded 5% commission on every offer your friendcompletes.Features- Daily Check-In: 10 Coins daily bonus- ReferralProgram: Invite your friends and you will be awarded 100 Coins,plus 5% commission on lifetime earnings. Your friend will receive50 Coins.- 4 Offer and Survey providers: Fyber, Supersonic,AdScendMedia, and more coming soon!- 5 Video providers: Vungle,Applovin, Supersonic, AdColony, Fyber- Surveys (comingsoon! )Rewards- PayPal Cash: Redeem your Coins to real-life cash.-Amazon Gift Cards- Google Play Gift Cards- Walmart Gift Cards-Tesco Gift Cards- Target Gift Cards- Best Buy Gift Cards- WholeFoods Market Gift Cards- PlayStation Gift- Xbox Gift Cards- iTunesGift Cards (coming soon! )- Steam Gift Cards (coming soon! )ReferralProgram- Simply share your *Referral Code* with your friend fromthe Invite page.- Ask your friend to enter your Referral Code afterthey install the app- Your friend will be awarded 50 Coinsimmediately, and you will be awarded 100 Coins plus 5%commissionNote: In order to prevent fraud, your friend must firstearn 200 Coins in order for you to receive your reward.If you haveany questions or suggestions feel free to contact us at any time. We always pay! And in less than 2 days! You can see the proofs ofpayment at the end of the images. Make Money is the Fastest Way toMake Money and Free Gift Cards with your Mobile or Tablet. GetMoney with PayPal or Skrill and Gift Cards from Amazon, GooglePlay, PlayStation Network (PSN), Xbox Live Gold, Steam, G2A andmany more... Make Money contains 10 partners to make money and giftcards much faster! And we add new partners every week! Earn Moneyand Gift Cards in your spare time by playing games, watching videosand completing surveys. It has never been so easy and fun to earnmoney! WARNING The following actions are prohibited: - Using VPN,proxy or bots to get unauthorized access to Make Money - UsingAndroid emulators - Use multiple devices with one account -Spamming referral codes Disclaimer: Make Money is not affiliated,endorsed or sponsored by PayPal, Skrill or gift card brands. Allproduct names, logos, trademarks and registered trademarks areproperty of their respective owners. Easily earn cash and Gift Cards by watching videos, trying new Freeapps and games, completing surveys, giving your opinion, testingservices, free trials,... with SUPER FAST payments in many ways.New tasks every day!You can get rewards anytime and from anywhere,there is no complicated missions to visit places or wanderaround.Guaranteed super fast payouts. Paying 100%. Just openappGreedy and start getting Rewards!★ ★ MANY CASH OUT OPTIONSCOUNTRY BASED★ ★ Rixty Prepaid CardBitcoin(Coinbase accountonly)Ethereum(Coinbase account only)Cherry CreditsNCsoftNCoinPaypalBattlePings Time CardsXbox Live CardsMINT PrepaidCardsGoCashBoyaa CardTQ Point CardWebzen WcoinsMinecraft Gamecardand CD keySteam Gift CardsKarma KoinDiablo 3 CD keysRedzen MuLegend CoinsGameStop Gift cardNeopets Neocash cardLeague of LegendsGift cardTarget Gift cardSirius XMCVS CardRoblox cardiTunes GiftCardWord of Warcraft Prepaid CardGroupon Gift CardFacebook GiftCardHulu PlusEn MasseGoogle Play Gift CardAeria GamesSkype PrepaidCardBest Buy Gift CardPlayStation Network Gift CardNintendoE-shopXbox live gift cardNETFLIX Gift cardWalmart Gift CardEAOrigin Gift CardToys R Gift CardAmazon Gift CardAND MANYMORE!! *Some cash outs are county specific★ ★ FEATURES★ ★ --DailyGifts--Lucky Spin--Minimum Cash out 5$--Affiliate Network. Earnwhen your friends complete tasks! Starts on 25% for all members andcan go up to 50% if you invite many of your friends! --High-MoneyContests--Many Cash out options. More added upon request!--ManyTasks to complete. New offers added every day!★ MULTILINGUAL★Switch appGreedy to your native language. Go to account settingsand select your preferred display language. We adding morelanguages regularly.★ How Does It Woks★ 1. Complete tasks to earnpoints2. Redeem your points and cash out3. GET THE REWARD! !★★VIPPROGRAM★★You can make really a big passive income from appGreedy ifyou have a Youtube channel, blog site, Instagram, Facebook orTwitter account with a lot of followers or other social networkwhere you can share your Invitation Code and win up to 60% of yourfollowers points.Contact us for info!Contact us for any queries youhave regarding our service at [email protected] We love to getfeedback from our users. *Apple, Amazon, Google, NETFLIX and Paypalare not sponsors of this promotion. Looking to earn free paypal cash and free gift cards?Download theapp, Watch videos and earn free paytm cash, free mobile recharge,free recharge free paypal cash, free gift cardsGift Cards Available: * Amazon Gift Card* Paypal Gift Card* Ebay Gift Card* Google PlayGift Card* Walmart Gift Card* BitcoinYou can also redeem to Freeamazon gift card and free paypal cash. We have added free bitcoinredeem in this update.